A HUGE unprecedented snowfall has cut off many roads in the Ronda mountains. School was suspended in the area and most people were unable to get to work as between three and six centimetres of snow fell. 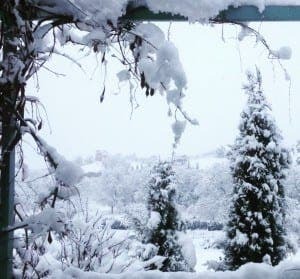 In one of the heaviest snowfalls in decades, the Serranía de Ronda bore the brunt of the snow, while heavy snow also fell in the Sierra de las Nieves and Sierra Bermeja above Estépona. With the temperature dropping to nearly zero on the Costa del Sol last night it was one of the coldest nights in history. The snow fell in cartama, alhaurin, mijas and even Malaga. The Axarquia and the Montes de Málaga have had heavy snow. A yellow warning has been declared for inland areas of Andalucia, while most of the key roads were gritted yesterday.